Headgear worn by special skills instructors, known as "Black Hats"
The United States Army Air Assault School, officially the Sabalauski Air Assault School (TSAAS), is a FORSCOM TDA unit located at Fort Campbell, Kentucky. Its primary task is training leaders and soldiers assigned to the 101st Airborne Division (AASLT), other United States Army units and United States Armed Forces service members in several courses annually. The school is named for Command Sergeant Major Walter James Sabalauski. 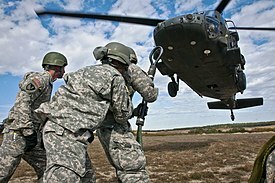 Air Assault School is known as the ten toughest days in the United States Army and the dropout rate is around 50 percent. 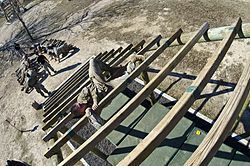 Approximately 15 percent of the class does not make it through the challenging Zero day which includes the demanding obstacle course. An average of approximately 30-40 students fail the course of those who make it past "Zero" day. Of those who fail after Zero day, many typically don't make it through the sling load testing in phase two. 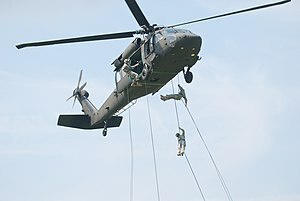 Air Assault School qualifies soldiers to conduct airmobile and air assault helicopter operations, to include aircraft orientation, slingload operations, proper rappelling techniques and fast-rope techniques. The school itself is 10 days of rigorous, fast-paced training. The high standards of the school require the student to take part in a 19 km (12-mile) march with rucksack in under three hours on the morning of graduation to be awarded their wings. The original school is located at Fort Campbell, Kentucky (home of the 101st Airborne Division). There are also or have been schools at Fort Rucker, Alabama; Schofield Barracks, Hawaii; Fort Hood, Texas; Camp Blanding, Florida; Fort Bliss, Texas; Fort Benning, Georgia; Fort Drum, New York; Fort Ord, California; Fort Richardson, Alaska; Fort Wainwright, Alaska; Fort Belvoir, Virginia; Fort Bragg, North Carolina, Camp Gruber, Oklahoma, and West Point, New York. Instructors at the course are referred to as Air Assault Sergeants. It is open to both males and females. The school is composed of learning helicopter insertion techniques, pathfinder operations, sling load operations as well as rappelling from buildings, cliffs and helicopters. Each day begins with rigorous physical training that includes unit runs from 3.2 to 8 km (2 to 5 miles). Attention to detail and tedious packing lists, the contents of which you carry in a 16 kg (35-pound) ruck sack daily, are also the order of the day; one missing item from these lists or failing any task from any phase of the course, could cause the student to be dropped from the school immediately. Courses offered at the Air Assault School include: Air Assault, Pathfinder, Pre-Ranger, Rappel Master and Fast Rope Insertion Extraction System (FRIES)/Special Purpose Insertion Extraction (SPIES) Master courses. TSAAS is also home to the Division's Parachute Demonstration Team. The 101st Airborne Division, a parachute and glider-borne unit that conducted two jumps during World War II, was converted to an Airmobile unit in 1968 in Vietnam, becoming the 101st Airborne Division (Airmobile). The parenthetical designation changed to Air Assault in late 1974. According to popular myth, the Airborne tab over the unit's Screaming Eagle shoulder patch remained because two of the division's units, a parachute rigger detachment and a pathfinder company, were both still on jump status. There is, however, no basis for this under AR 670-1, Wear and Appearance of Army Uniforms and Insignia. According to The Institute of Heraldry, the Airborne tab is “an intrinsic part of shoulder sleeve insignia,” not a detachable insignia added if a unit is on jump status, and according to its records the unit is still designated the 101st Airborne Division. There are numerous other non-parachute units with subordinate parachute units, such as long range surveillance troops (company equivalents) within battlefield surveillance brigades, but their presence does not entitle entire brigades to wear the Airborne tab. Regarding the division’s remaining parachute units, it now has one pathfinder company in each of its two aviation brigades, but the rigger unit was separated from the division many years ago. Until late 2013, parachute rigger support was provided by the locally assigned 4th Platoon of the Fort Bragg-based 647th Quartermaster Company. In October 2013 jump status for the two pathfinder companies was terminated, leaving no parachute positions within the division, and the rigger platoon departed from the post. In 2015 the 159th Combat Aviation Brigade was inactivated, along with its pathfinder company, and in 2016 the pathfinder company of the Combat Aviation Brigade, 101st Airborne Division (formerly the 101st Combat Aviation Brigade) was inactivated as well. This left the 101st with the same configuration as the 10th Mountain Division, a light infantry unit. Graduation from the Air Assault School is not required to be a Soldier in the 101st, but it is looked upon as an achievement of excellence by the chain of command. In 1998, a new 34-foot (10 m) tower was completed and Phase Three began to train at this site. On 17 December 1999 the new Sabalauski Air Assault School facility was dedicated and for the first time in several years all phases of instruction are conducted at one facility. Over sixty classes are run annually, training over 8,000 soldiers per year. Soldiers are not considered “Air Assault Students” until after successful completion of Zero, the first day of the course, which requires students to complete an obstacle course, two-mile (3.2 km) run, and extensive physical training. This inspection is extremely meticulous. It is conducted after the 9.7 km (6 mile) foot-march on day one. Soldiers must have all items on the packing list each student is given, with each item clean and serviceable (in usable condition). If a soldier is missing any item during the inspection, that soldier will be immediately dropped from the course. The inspection has a very specific lay-out that the soldier must adhere to. Every item must be placed exactly how the Air Assault instructors have displayed the items, and all items must be laid out "as worn." The obstacle course is designed to assess a student’s upper body strength, agility, endurance, confidence, and ability to perform at heights without displaying fear or distress. This test is critical in determining if a student will be able to complete Air Assault School without becoming a safety risk to themselves, instructors, or other students during the tough and demanding training events conducted throughout the course. There are nine total obstacles. There are two obstacles that are considered mandatory, and failing one of the two will result in being dropped from the course. The other seven are minor obstacles, and the Air Assault prospect is allowed to fail one of the seven and still continue. This means that failing two of the minor obstacles will result in being dropped from the course. Prior to the obstacle course, students will conduct a two-mile (3.2 km) run. Students must complete the run in under 18:00 to receive a "GO" in the event (meaning satisfactory completion of the event). The uniform for the run is Army Combat Uniform (ACU – minus the ACU Top depending on the season in which the training cycle begins) with running shoes. Written – The written test consists of 50 multiple-choice questions. Soldiers must achieve 70 percent to receive a "GO" on the written test. Hands-on – Students are tested on 10 of 16 hand-and-arm signals and must correctly perform seven of the 10 to receive a "GO". Soldiers must pass both tests to move on to the Sling Load Phase. They are allowed one retest per exam. Students brace against the rotor-wash of a UH-60 Black Hawk as they prepare to attach a slingload during one of the practical exercises. Hands-on – Students are tested on four of the six loads taught. Students must identify three out of four preparation and/or rigging deficiencies within two minutes per load to receive a "GO". Soldiers must pass both tests to move on to the next phase. They are allowed one retest per exam. Soldiers must pass all tests to move on to the next phase and are allowed one retest per exam. The reason the standards of this course are so strict, is because if the soldier does not grasp and then master the skills that are being taught, the chances of an accident increase greatly. The margin for error in this type of training is small. The final event is the 12-mile (19 km) ruck march. Soldiers must complete the 12-mile (19 km) ruck march with the prescribed uniform and equipment in three hours or less in order to graduate. The ruck march is a graded task and a graduation requirement for Air Assault School. Upon completion of the ruck march, Soldiers must do a layout of all items in the packing list. Failure to have 100% of the items results in a failure and not being able to graduate. Graduates are awarded the Air Assault Badge and the 2B ASI (Additional Skill Identifier) unless they did not come out of the helicopter qualified to inspect rigged sling loads. Graduates in the rank of Corporal (E-4) and above are qualified to perform as rappel lane NCOs for ground rappel training and are eligible to attend the Rappel Master Course. 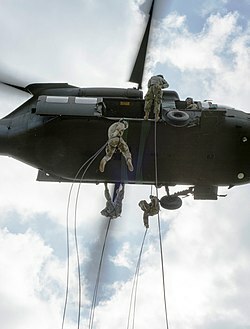 Graduates in the rank of Sergeant First Class (E-7) or above are qualified to serve as a rappel site Safety Officer for ground and aircraft rappelling. ^ "SAAS course descriptions". Archived from the original on 31 December 2007. Retrieved 1 February 2008. This page was last edited on 21 April 2019, at 18:55 (UTC).